I took the picture that accompanies this post from atop a trash can at the corner of Ocean Avenue and Montana Avenue in Santa Monica on Saturday. Thousands of people rallied there at the end of one of 800 March for Our Lives events that were held around the world that day for students, their families and friends to speak out against gun violence. As you’re no doubt aware, the largest of the marches took place in Washington, where the student leaders from Marjory Stoneman Douglas High School in Parkland, Florida spoke to a crowd of hundreds of thousands of people. It was only six weeks ago that 17 students were killed in a mass shooting at Stoneman Douglas High. This past weekend a million or more people marched around the world in support of the Parkland students’ movement that is encapsulated with the hashtag NeverAgain. Like many of you, I’ve marveled at and been inspired by the initiative of a group of high school students who have organized themselves to lead a nationwide movement to curb gun violence. Assume authorship of your story. Tragically, there have been many school mass shootings since the one at Columbine High School that demanded the world’s attention in 1999. And, tragically, the story has usually been the same—a few weeks or days of media attention and then the focus of the news cycle moves on. The Stoneman Douglas students decided that it was going to be different this time. They took authorship of their story. They moved beyond being survivors of a school shooting by taking control of their narrative. Within a day or two of the shooting, they organized themselves to get their message out—that there are things that can be done to end mass shootings at schools. Tell your story. Once you’ve authored a story, you need to tell it if you hope to make an impact. The Stoneman Douglas students have been masterful in this respect. They’re authentic and relatable. They tell their story in a way that enables listeners to empathize with what they went through and are going through. They’re consistently articulate, clear and succinct in their interviews, speeches and online. They’re not preaching to the choir of people who already agree with them. By telling their story in the way they do, they make it easy for people who don’t already have their minds made up to connect with their story. That’s what compelled hundreds of thousands of people to turn out for a march to show their support. Connect and stay connected. There’s been a lot written about how awesome the Stoneman Douglas students are at social media. They are but they haven’t always been. As The New York Times reported a few weeks ago, many of them learned in real time the most effective ways to use Twitter and Instagram to connect with people. They’ve used the tools and platforms available to them to connect with supporters, recruit new supporters and mobilize them to action. Partner with others while staying true to yourself. It’s probably obvious that a group of high school students can’t organize marches around the world without help. 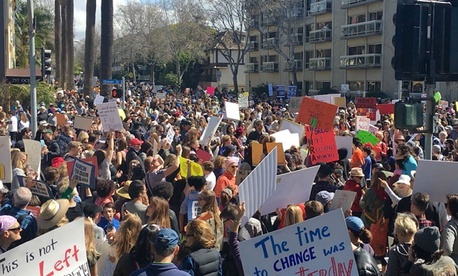 One thing I noticed at the march in Santa Monica this weekend was how many parents and grandparents were marching with their kids. The parents were there to support the kids who were in the lead. I assume that’s the case with the core group of leaders at Parkland. Of course, to pull off what they did this weekend, you need more than help from mom and dad. Again, as the Times reports, numerous national organizations contributed money and resources to help the Parkland students organize and produce the March for Our Lives. True enough, but the speakers were all students who stayed true to their message and purpose throughout. Don’t be afraid to punch above your weight. The Parkland students didn’t buy the conventional wisdom that there’s nothing a bunch of kids can do about something as complicated as ending gun violence. They’re punching above their weight by mobilizing hundreds of thousands of their peers and the parents of their peers to do what it takes to keep schools safe. They’ve leveraged their First Amendment rights and, coming soon for many of them, their right to vote to drive the change they think is needed. What’s next for the students of Stoneman Douglas High School and their movement? It’s got to be a bit of a let down on the Monday after you turned out a few million people around the world to march for your cause. Now the grind begins. Based on what they’ve done and dealt with so far, I wouldn’t bet against them.